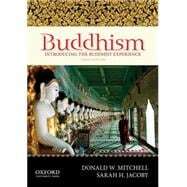 by Mitchell, Donald W.; Jacoby, Sarah H.
Buddhism: Introducing the Buddhist Experience, Third Edition, focuses on the depth of Buddhist experiences as expressed in the teachings and practices of its religious and philosophical traditions. Taking a more global and inclusive approach than any other introductory text, the book spans more than 2,500 years, offering chapters on Buddhism's origins in India; Theravada and Mahayana Buddhism; Buddhism in Southeast Asia, Tibet, China, Korea, and Japan; and the globalization of Buddhism with a focus on the United States. The volume is enhanced by substantial selections of primary text material, numerous boxed personal narratives by respected Buddhists and scholars, maps and photos, and six essays on cultural experiences of Buddhism around the world today. Donald W. Mitchell is Professor of Philosophy at Purdue University. He is the author of The Gethsemani Encounter: A Dialogue on the Spiritual Life by Buddhist and Christian Monastics (1997). Sarah H. Jacoby is Assistant Professor of Religion at Northwestern University. She is the coeditor of Buddhism Beyond the Monastery: Tantric Practices and their Performers in Tibet and the Himalayas (2009).